Full version license key for RoboForm. The license is active for 1 year. Download the full version RoboForm with serial code and save $19.95. 1-day giveaway in collaboration with other vendor. You must hurry to download it for free before the offer expires. 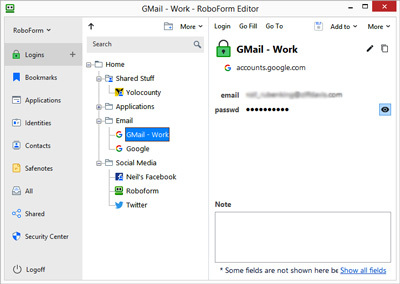 RoboForm is automatic form filling and password manager like Sticky Password Premium. The application can embedded automatically after install on browser and Windows applications. It useful if you are open a website often that requires form filling or password. It help to make your life easier. Like other similar apps, RoboForm features with one-click tool to fill an online form. RoboForm not just works on Windows. The software is also available for Mac OS. To download visit the following giveaway page. Visit the giveaway page: The free offer link! RoboForm Everywhere giveaway license is available for 24-hours/1-day only. Don’t miss this offer, visit the giveaway page to download the software for free. Save an account & password that can be used to login into a specific website or application automatically. Automatic fills long registration forms with one click. Encrypts the data and personal information. Generates secure passwords to protect with password generator. Sync and backup password. It useful for multi-platform included on mobide device. You can use RoboForm Everywhere on Windows and Mac. And sync the data with your iOS or Android smartphone or tablet.